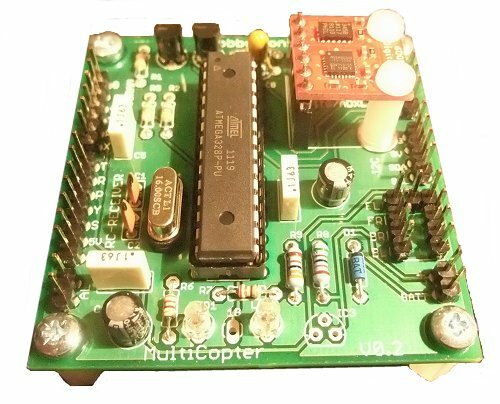 There are a number of flight controller boards available for quadcopters and tricopters, and this is our take on the idea. We wanted to produce and all-in-one board that contained the processor, accelerometer, gyro, voltage regulators and most everything else needed electronic wise. We also wanted it to be easy to build for a novice, so it uses only through-hole components, but expandable to allow additional sensors to be added. 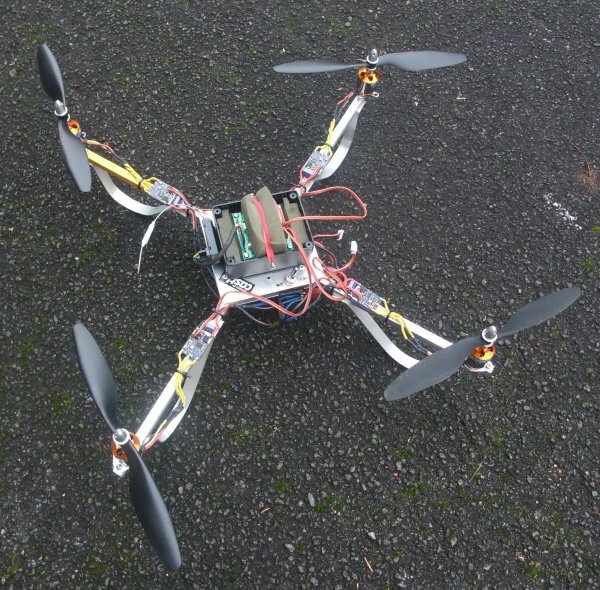 The Multicopter Flight Controller board is a general purpose flight controller although it has been designed around the schematics for the MultiWii flight software which is written for Arduino based boards. The MutliWii software was originally written to use the accelerometer out of a Nintendo Wii controller, but also includes code to use other accelerometers and gyro boards. We have built our flight controller board to use the Sparkfun ITG3200/ADXL345 sensor board, but other I2C accelerometer/gyro boards may be used instead including the original wii controller board. Check out the MultiWii website for more details. Our Multicopter Flight Controller board is available as a basic board only, as a kit of components, and as a fully built unit (with or without sensor board), so you can choose the option which best suits you. Why have we built this board? Lower hardware requirements than many other systems - i.e. cheap! Their design is mainly based around an Arduino Pro-Mini board and either the Wii controller or another Accelerometer/Gyro board (there are many supported by the software). There are however a few problems with this setup. What you may end up with is an Arduino Pro-Mini board, an Accelerometer board and another board (perhaps a stripboard) with Voltage regulators, resistors, smoothing capacitors, connectors etc, and the wiring between them all. So we designed this board to be an all-in-one solution (at least for our chosen Accelerometer/Gyro) that is easy to build for the novice using only through-hole components. We could have made the whole lot smaller by using surface mount components, but a lot of the fun in making one of these 'copters is in the building, so we offer this as a kit (although you can buy a built up one if you want).